David Walliams fans, are you ready for an absolute MAMMOTH of an adventure? David is releasing his biggest and most epic adventure yet... pre-order his new book The Ice Monster now! New from David Walliams and Tony Ross, Geronimo is a delightfully topsy-turvy book with an uplifting message about following your dreams. Perfect for David Walliams' younger fans! Prepare yourself... A brand new collection of horrifically hilarious stories about the absolute worst children EVER in THE WORLD'S WORST CHILDREN 3! The Boy in the Dress has gone FULL COLOUR in a brand-new gift book in celebration of David Walliams' 10th anniversary as a bestselling children's author. Grandpa's Great Escape has gone FULL COLOUR in a brand-new gift book in celebration of David Walliams' 10th anniversary as a bestselling children's author. David Walliams’ heart-warming comedy comes to the stage for the first time in a musical adapted by Mark Ravenhill, new songs from Robbie Williams and Guy Chambers, directed by Artistic Director Gregory Doran. The World of David Walliams Post Box! David Walliams is pictured at the unveiling of a special edition Royal Mail postbox celebrating his literary work outside London's Natural History Museum, which features in his book The Ice Monster . A HUGE announcement from David Walliams! Walliams fans, we have a very special treat for you! 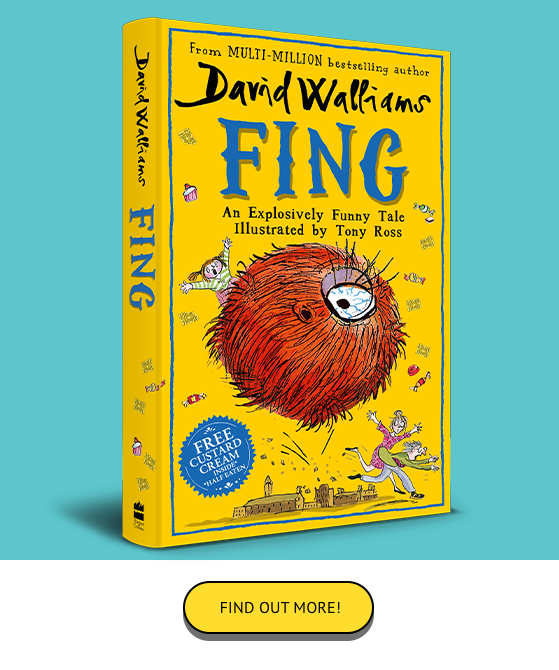 Today, David has announced his brand new novel FING, coming to a bookshelf near you in just a few weeks! Watch the Midnight Gang on Boxing Day! Don't miss the drama adaptation of The Midnight Gang on BBC One on Boxing Day from 7.30pm! Join David Walliams on 9 Dec at the Garrick Theatre, London for a fabulous festive family adventure as he brings his new novel The Ice Monster to life. Tickets on sale now! Watch the trailer for Billionaire Boy The Musical. Coming this Christmas at NST City! BIG NEWS! David Walliams will be in London, Newcastle and Manchester this November signing copies of his epic new novel, The Ice Monster! Mammoth announcements from David Walliams! We are in for a wonderfully Walliams winter indeed! Today, David Walliams announced not one but TWO new children's books: The Ice Monster and Geronimo! The rehearsals at Chichester Festival Theatre have started for The Midnight Gang, and David Walliams dropped by to join the gang for their read-through! David appeared on stage in his live show “Big Laughs” on 23 August 2018. Check out the photos here and stay tuned for the full show, which will be available on YouTube soon! Catch a whiff of something special this summer? That's right, Chickenshed wowed London audiences with a malodorously magnificent musical adaptation of Mr Stink! David Walliams visited Churchfields Junior school in South Woodford to surprise this year’s winner of the National Young Writers’ Awards. Super Raj saves the day in this wickedly wonderful comic strip from Book of Stuff! The winner of our Walliams in 10 competition was a wonderful medley of David Walliams books performed by St Peter's Ashton Primary School! Watch it now! Sharpen your pencils and sharpen your wits! Here is THE GREAT BIG WORLD OF DAVID WALLIAMS QUIZ! Play our Book of Stuff games! Find out which David Walliams character you are and create your own book title with our exclusive Book of Stuff games! Celebrating ten wonderful Walliams years! Celebrate ten wonderful Walliams years with glorious gift editions of Mr Stink and Gangsta Granny in full colour! Awful Auntie comes to the stage! From the award-winning producers of Gangsta Granny comes this amazing show, starring a very large owl, a very small ghost and a very awful Auntie! FUN ACTIVITY ALERT: Download and play your own World's Worst Children SNAP! You came here to meet David Walliams, well here he is! David Walliams’ picture book world is packed with playful animals on some of the most amazing – and rather unusual – adventures EVER.